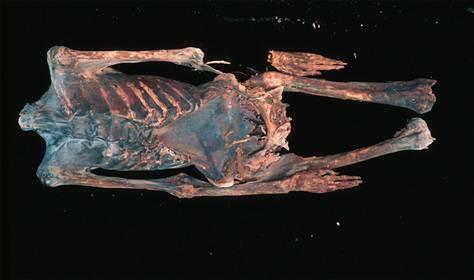 Dakhleh Oasis Project - This mummy was discovered in Dakhleh Oasis, a remote outpost in southwest Egypt. He lived around 1,800 years ago, at a time when the Romans occupied Egypt; he died when he was 20-25 years old. Although much of the mummy remains are lost, the area around the lungs, where particulates were found, is well preserved. But after hearing of reports of such particulates being found in mummy tissue, Roger Montgomerie, a doctoral student at the KNH Centre for Biomedical Egyptology at the University of Manchester, decided to take a closer look at mummified lung tissue. His work represents the first attempt to identify and study particulates in multiple Egyptian mummies. 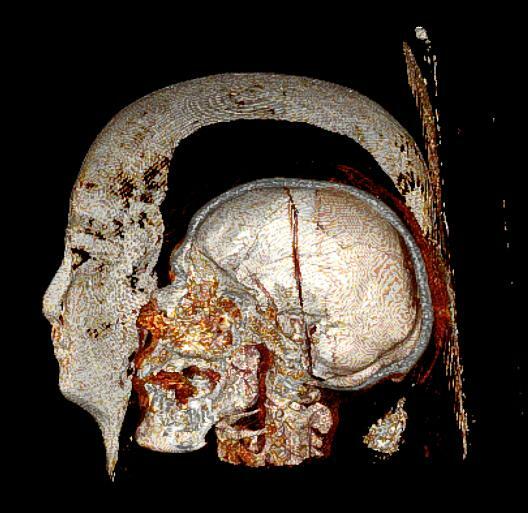 Credit: Dr. Michael MiyamotoThe ancient Egyptian mummy Djeher as imaged with a CT scanner. Djeher was found to have heart artery and other vascular disease. Djeher lived between 304 and 30 BC. © 2011 LiveScience.com. All rights reserved.